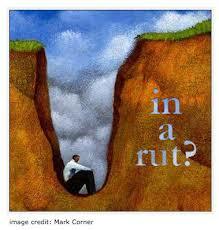 Trading ruts are something that tends to have a huge impact on new traders. What happens is you take a few losses and because of that you become ‘selective’ in your trades. Now when I say selective, I don’t mean in the good, filter out the ones that don’t fit my rules perfectly way. Instead you find yourself seeing setups but sitting back and ignoring them because it ‘just doesn’t feel right.’ You maybe do this two times and watch as both of those trades go on to work perfectly. You amp yourself up and decide that no matter what, you’ll take the next trade. The trade comes, you jump in the market, proud of yourself… and it loses. This reinforces your nervous approach to the markets and the cycle continues until you find yourself getting out of winning trades too early just so you can lock in some profit and holding onto losing trades for too long, desperate to avoid more losses. So how do you deal with it? Dealing with uncertainty and probabilities is not easy. And I wouldn’t say it becomes easy – you just learn how to deal with it. First, decide that you want to be a trader. Simple, right? Too simple, maybe. But it is key. Once you have decided you want to be a trader, really taken it to heart and decided that yes, this is what I want to do and I’m going to give it everything I have, then you’re in a much better place. Because you’re willing to learn and to go through the tough times in order to come out the other end successful. The other side of the coin are those who want instant results and to become millionaires overnight. They walk through life as though the world owes them something and when it doesn’t work… hey, it’s everyone’s fault but their own. The sad fact is that this attitude doesn’t work and it will cripple you as a trader because when trading, your money can disappear very quickly if not managed properly. Once you’ve decided that you want to be a trader, you need to begin working on ways to stick to your well thought out and tested plan. One of the important factors to consider is risk management. It is a lot easier to take one, two, even three losses in a row if that only means you’re losing 3% of your capital. But if you’re risking say 10%, then losing 30% is a lot more difficult to accept and brush off as part of the business. When you have losses, if you can feel them weighing on you, go back and look at your system. Go over the charts and show yourself once again that it works. Look at your losses also and make sure they were losses that couldn’t have been avoided. If you followed your rules properly and took a loss, that’s fine. But if the loss was down to a mistake then identify it and work on ways to avoid the same mistake in the future. Your methods for only taking the proper trades can be simple – literally sit on your hands until you run through all of your entry parameters. When they all line up, only then can you touch the mouse and begin setting your order. Give yourself small rewards for perfect trading days and weeks when you execute all of your valid trades properly.